Excessive noise is a serious public heath issue. High noise levels are associated with hearing loss, heart disease, sleep deprivation, chronic fatigue and ringing in the ears. Loud noise also damages communities and reduces property values. The nonprofit organization Noise Free America is fighting back on behalf of America’s peace and quiet with a new book, Guide to Modified Exhaust Systems: A Reference for Law Enforcement Officers and Motor Vehicle Inspectors, a handy visual guide that helps police easily identify the worst noise offenders on the road — illegal aftermarket motorcycle exhaust systems. 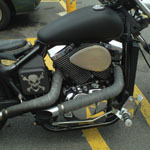 Illustrated throughout with color photographs of illegal modified exhausts, Guide to Modified Exhaust Systems offers police officers and vehicle inspectors easy identification of illegal exhaust systems, providing unequivocal photographic evidence for a citation that will stand up in court. Guide to Modified Exhaust Systems is a great practical tool to help communities protect their health and property. Get your copy today.